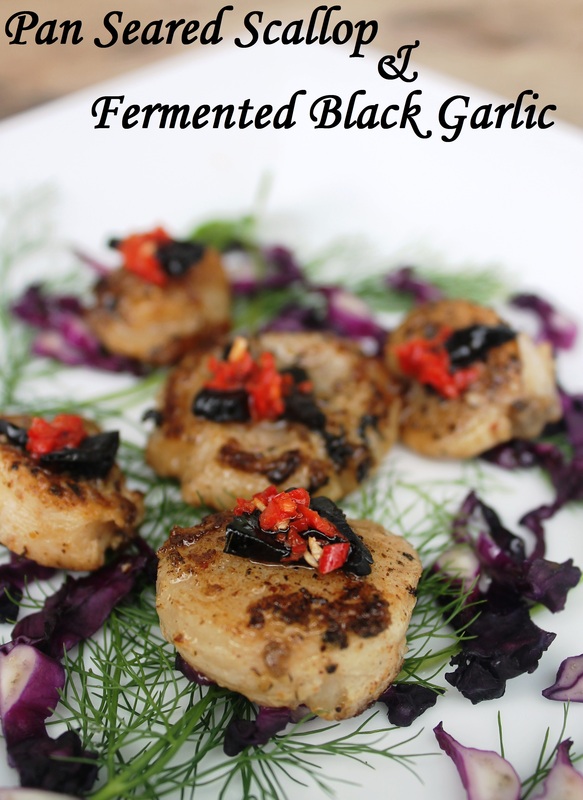 Black garlic is a type of fermented garlic used as a food ingredient in Asian cuisine, especially Korean. It is made by fermenting whole bulbs of garlic at high temperature, a process that results in black cloves. The taste is sweet and syrupy with hints of balsamic vinegar or even tamarind.Black garlic’s popularity has spread to the United States as it has become a sought-after ingredient used in high-end cuisine. But now, you can make your homemade fermanted black garlic easily if you following my instruction. In Korea, black garlic was introduced as a health product and it is still perceived as health supplementary food. Black Garlic is prized as a food rich in antioxidants and added to energy drinks, and in Thailand is claimed to increase the consumer’s longevity. It is also used to make black garlic chocolate. It was written up in the Spring 2008 “Design and Living” special section of The New York Times as a “new staple” of modern cuisine (and incorporated into a recipe, “Black Garlic Roast Chicken”); the NYT author, Merrill Stubbs, noted it was being used by chef Bruce Hill of Bix Restaurant, San Francisco.Matthias Merges, executive chef at Charlie Trotter’s in Chicago, listed black garlic as one of his top five food finds in Restaurant News in December 2008. The rise of black garlic in the US was called “sensational,” and other trade publications besides Restaurant News have noticed the trend. Many people acceptence is commonly known because fermented black garlic is far away from the the raw state. The taste is so light and the texture is buttery. 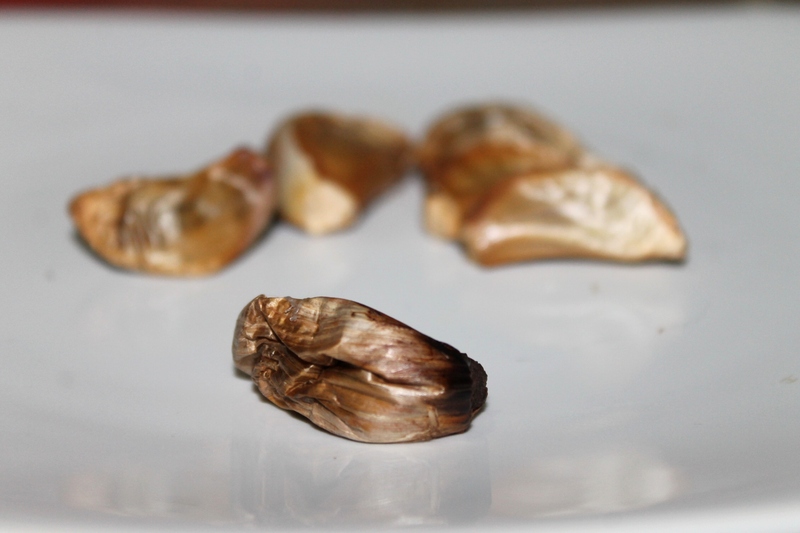 When tou used to eat a pleasant slow roasted garlic, the fermented garlic is lighter even more. You can easily spread the black garlic over a tosted bread since it so soft in texture. Since i can access any ready made fermented black garlic, i search for how to make homemade black garlic in your kitchen. Ok, Then i though that i can cross my finger when i know the secret is to sealed it vaccumly and let it fermented n relative high heat. The other principal is don’t let any humidity lefted the garlic. I made it by myself now, simple sealed any air by partially submerged the plactic containing garlic in water and then twisted it and and make a thigh. From 20 cloves garlic, i submerged 1o garlic in water and drained then thighly sealed. After that i put the garlic in the bottom space of my rice warmer. let it fermented for 40 days. fermented black garlic, berfore and after peeled ! 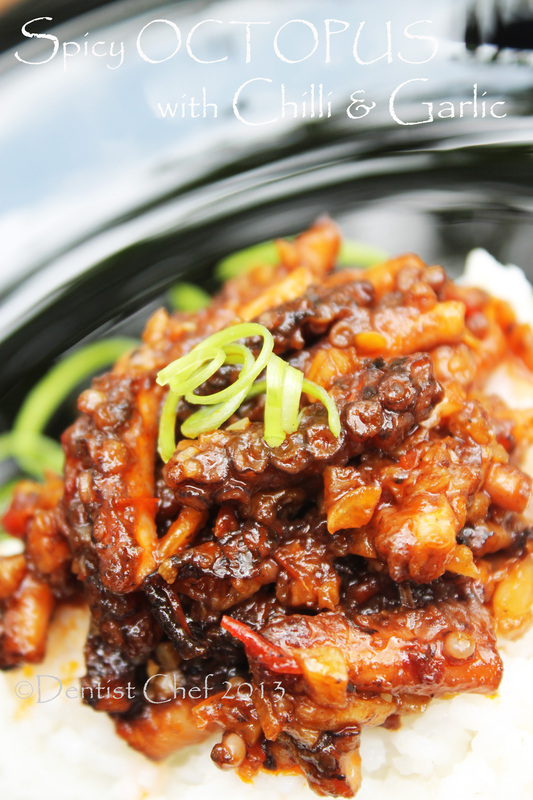 From 20 cloves, the succesed fermented black garlic is just 6 of them. OK, i’m fine with it, that’s why i know that why black garlic is pricey. 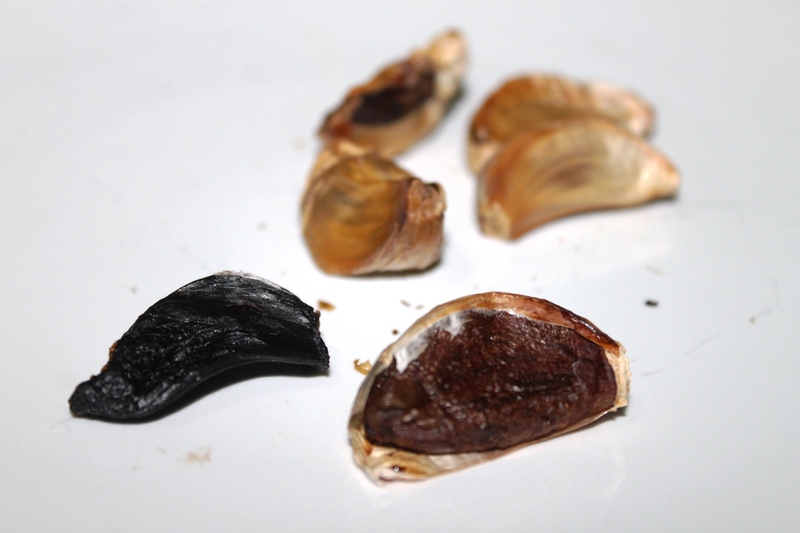 From my investigation, i found that any lekeage in the plastic can driven away the water content and transform the garlic into a brownish dried garlic, while the thighly sealed transform into black garlic. can you note the diffrence between fermented black garlic and the failed ones ? Heat up 1/2 tbsp oil and butter in a grill pan until smoking hot. Pat dry the scallop and seared it 1 minutes each side. Transfer into serving plate and put the sliced black garlic and chili oil above it. This entry was posted in Appetizer, Fine Dining (Homemade) Recipe, Indonesian Food, Japanese food, Resep Kerang (SHELLFISH,CLAMS), Resep Korea (Korean Food), Resep SALAD, Resep SCALLOP, Resep SEAFOOD, Western Food and tagged black garlic recipe, canadian scallop recipe, fermented black garlic, fermented black garlic recipe, homemade black garlic, how cook black garlic, how cook scallop, how make fremented black garlic, how to cook korean black garlic, how to pan fried scallop recipe, how to sear scallop brown, how wake seared scallop, korean black garlic recipe, pan crusted scallop recipe, pan fried scallop recipe, pan seared scallop recipe, recipe black garlic, recipe sea scallop black garlic, seafood appetizer recipe, seared scalllop recipe. Bookmark the permalink. Thanks very much for visiting my blog and also your comment. 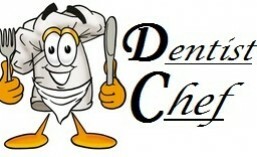 Wow…there are so many lovely recipes on your blog with really nice photography. This is the first time I heard about black garlic. My goodness…..that’s really black….haha. Thanks very much for sharing. yeah they turn out so black, kinda exotic..
Wow, you are an amazing chef and your photos are great! I’ve never heard of black garlic before, but it sounds delicious! I’m excited to uncover this great site. I need to to thank you for your time due to this fantastic read!! I definitely loved every little bit of it and i also have you book marked to look at new information in your blog. Thanks for introducing a new ingredient to me: black garlic. 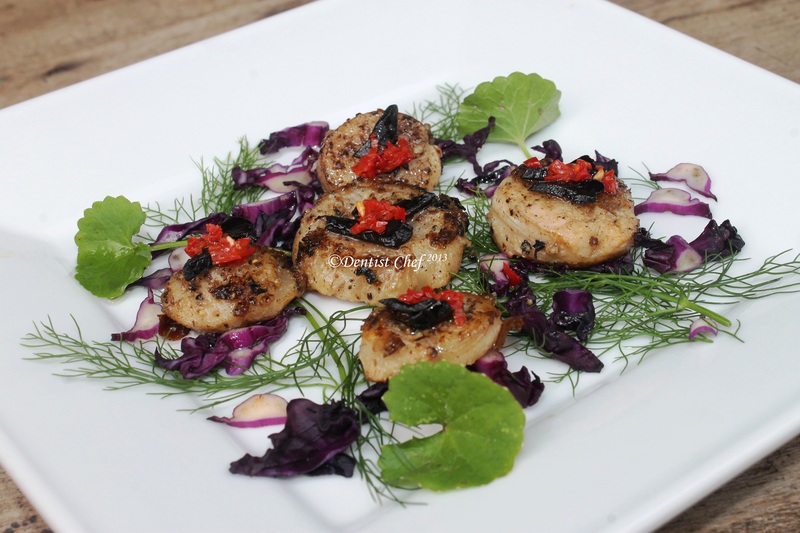 This recipe with the scallops sounds like a good begin! MMMMM! The dish looks outstanding too! oh my… Again this looks wonderful! I love scallops. Exotic dish! Great photos too. Korean black garlic in booming over now, i dont like garlic but admire the black garlic for it’s creamy and soft texture. 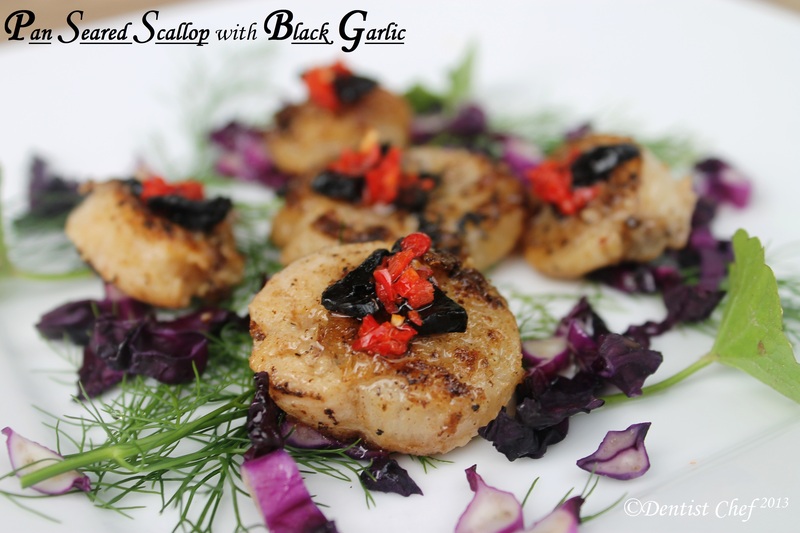 Oh I love scallops, and this combination just sounds amazing!